Noy Gombuj Masjid (Nine Domed Mosque) is another silent speaker of the cultural excellence of Bengal (Now at Bangladesh) in 15th century. As I mentioned in my post Shat Gombuj Masjid, during the Sultanate era of Bengal, Sultan Nasiruddin Mahmud Shah appointed a saint general Khan Jahan Ali to decorate Khalifabad (now Bagerhat) area. The saint general showed his architectural excellence and created a number of mosques. Noy Gombuj Masjid is one of the beautiful these archaeological treasure. Noy Gombuj Masjid is a brick built structure measuring about 16.76 meter externally with 2.44 meter thick wall. Nine domes are placed on the roof with three rows of three columns each. North, south and east wall of this square shaped architecture have three arched opening. The Qibla wall (Western wall) is internally recessed with three engrailed arched Mihrabs. Central Mihrab is larger than others. Terra cotta floral scrolls and flower motifs are the decorations seen around the Mihrab. But most interesting features of this mosque are its curved cornice and corner towers. This is a signature of Khan Jahan style. Two cornice bands are decorated with lots of lotus panel and lozenges. Corner four corner towers (Miners) are divided with by molded bands. Decorated motifs as lotus panels, lozenges are depicted on the towers. 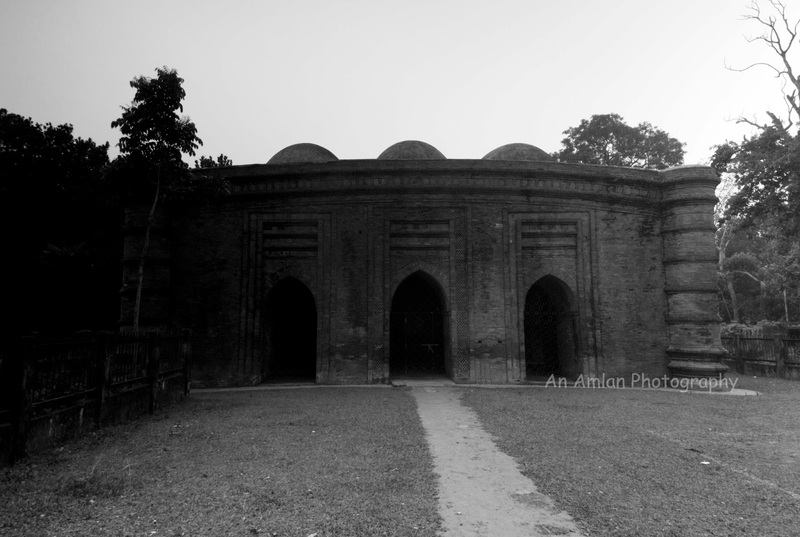 Noy Gombuj Masjid is located near Thakur Dighi at bagerhat. It is 10 minutes walk from Khulna Bagerhat Highway.